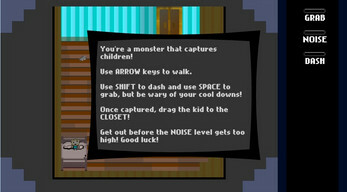 Ludum Dare #33 COMPO submission, "kid.isCaptured". You're a monster that captures children! Use ARROW keys to walk. Use SHIFT to dash and use SPACE to grab, but be wary of your cool downs! Once captured, drag the kid to the CLOSET! Get out before the NOISE level gets too high! Good luck!